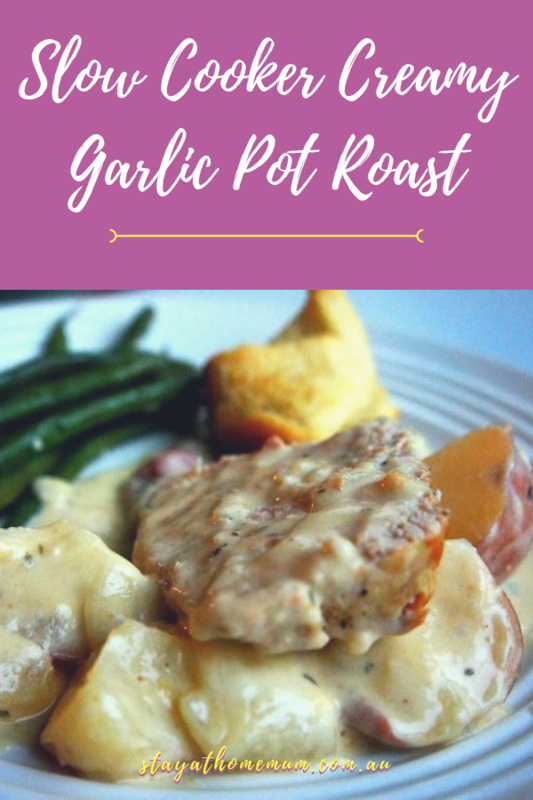 Slowcooker Creamy Garlic Pot Roast is one of my favourite meals. It is so cheap and when done in the slowcooker, it just breaks apart. This Slow Cooker Creamy Garlic Pot Roast recipe was a bit of an ‘experiment’ and I’m really pleased with the results! Melt the butter in the slowcooker and add the onion rings and garlic. Allow to cook gently for 30 minutes on high. Add the flavouring and the cream and mix well. Move the creamy mix to one end of the slowcooker and add the pot roast. Pile the creamy mix on top (as much as you can) and cook on low for 5 hours. Slowcooker Creamy Garlic Pot Roast can be frozen up to one month. Fabulous when served with creamy mashed potatoes - or to be even 'slacker' - throw potato pieces in with the slowcooker! Add some beef stock cube/ curry powder/ harissa paste/etc. if you want some flavouring.